Cardiomegaly (enlarged heart) isn’t a disease on its own, but rather a symptom of another condition. An enlarged heart can be seen on X-ray images, but additional tests are required to determine the exact cause of cardiomegaly. Cardiomegaly can be temporary or chronic, depending on its underlying cause. In many cases, cardiomegaly is a treatable condition, but it’s important that you see your doctor at the first sign of the condition. The main type of enlarged heart is dilated cardiomyopathy, where both ventricles of the heart become stretched and thin. Another type is hypertrophic cardiomyopathy, where the walls of the heart become very thick—it is an inherited condition. An enlarged heart can function better when it is thicker, compared to when it is thinner. An enlarged heart is often caused by another condition, which puts added stress on the heart and leads to heart damage. Although there are many different causes for an enlarged heart, in some cases, the cause is unknown. A common cause is stress on the body, especially during pregnancy, but in this situation, the cause is temporary, so the damage isn’t as lasting. 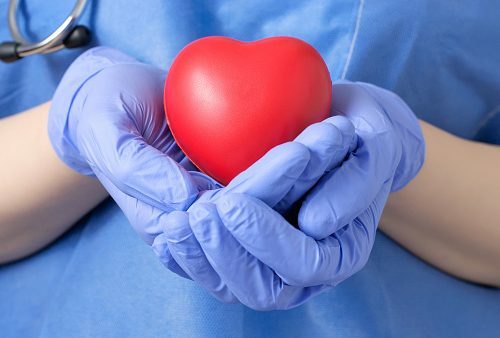 An enlarged heart is a symptom of another condition, meaning the associated symptoms you may experience are connected to what is causing cardiomegaly. Symptoms of an enlarged heart are often similar to the symptoms of congestive heart failure, because the heart is unable to pump blood properly. These include shortness of breath, leg swelling, weight gain—particularly in your midsection—feeling tired, and heart palpitations. Some patients may never develop any symptoms, so an enlarged heart could go undiagnosed and only get detected during an examination for another condition. As mentioned, depending on the cause of an enlarged heart, other symptoms may be experienced. If you’re not feeling right, it’s always a good idea to investigate further. Anemia: A condition where there is a lack red blood cells. This results in the heart beating faster, becoming enlarged. Congenital heart disease: Due to genetic predisposition, some people are born with an abnormal heart structure. This may lead to heart enlargement when born or over time. Connective tissue disease: A group of diseases that involve the protein-rich tissue that supports the organs and other parts of the body. Connective tissue diseases such as Marfan syndrome can contribute to an enlarged heart. Excessive iron in the body: Also known as hemochromatosis, it causes the body to absorb too much iron from the food you eat. Excess iron can become stored in the organs, like the heart, resulting in their enlargement. Family history: Having a mother or father or anyone else in the family with an enlarged heart due to genetic reasons substantially increases your risk of developing it as well. Fluid around the heart: Also called pericardial effusion. It is the result of abnormal fluid collection around the heart, causing it to pump harder and become enlarged as a result. Heart attack: Suffering from a myocardial infarction can lead to an enlarged heart. Heart valve disease: When there is a problem with valves that control the passage of blood through the heart chambers, blood that is not pumped efficiently gets backed up and causes the heart to work harder. This results in the heart becoming enlarged over time. Heart valves may be affected by rheumatic fever, congenital defects, and even some medications. Thyroid disease: Having either an overactive or underactive thyroid gland can result in an enlarged heart. Heart failure: This is a serious condition that is commonly the result of an enlarged left ventricle. Due to heart muscle weakening and dilation of the ventricles, the heart is unable to pump a sufficient amount of blood throughout the body. Blood clots: Because the heart is not pumping efficiently, stagnant blood within the heart becomes an issue. When blood is not moving, it tends to coagulate or clump together. When this happens, blood clots form, which can travel to other places in the body and become lodged in blood vessels. Heart murmur: An enlarged heart is incapable of pumping blood efficiently, and as a result, it will beat out of sync. Cardiac arrest or sudden death: An enlarged heart can result in decreased blood supply to the heart itself. If the heart rhythm has become too slow to allow the heart to beat properly, fainting or even death may occur. Chest X-ray: An x-ray of your chest will allow your doctor to see the condition of your lungs and heart, and if the heart appears enlarged, further tests will be ordered to determine the cause. Electrocardiogram: These record the different electrical activities that take place within the heart through the use of electrodes applied to the skin. This test can be used to determine whether there are issues with your heart’s rhythm or find damage leftover from a heart attack. Echocardiogram: An echocardiogram is an ultrasound of the heart that uses sound waves to create a video image that allows doctors to see if the is enlarged. All four chambers of the heart can be examined this way. Stress test: A stress test is usually composed of walking on a treadmill or riding a stationary bike while doctors monitor your blood pressure, heart rhythm, and breathing, and allows doctors to see how well your heart performs under exertion. Cardiac computerized tomography (CT) or magnetic resonance imaging (MRI): Both scans take images of the heart while you lie still on a table and are moved either through a large ring or tube. The images produced can help your doctor determine whether your heart is enlarged. Blood tests: Blood tests evaluating the levels of specific substances within the body can also help determine if your heart is enlarged and rule out other causes that may explain your symptoms. Cardiac catheterization and biopsy: A catheter inserted in the groin and threaded through the blood vessels into the heart may be used to extract a biopsy of the heart for analysis. Medical devices to regulate your heartbeat: If you have a certain type of enlarged heart, you may be fitted with a pacemaker to coordinate the contractions of the left and right ventricles in order to keep your heart pumping normally. Heart valve surgery: If your issue is due to a problem with one or more valves in your heart, corrective surgery may be completed by either fixing the affected valve or replacing it. Coronary bypass surgery: If coronary artery disease is the cause of your enlarged heart, then your physician may recommend coronary bypass surgery to fix it. Left ventricular assist device (LVAD): An LVAD is a mechanical pump that is implanted into the heart to help it continue to pump normally in instances of heart failure. Heart transplant: The last resort for patients with enlarged hearts is a heart transplant, though there is a shortage of donor’s hearts that makes it difficult for even the most critical of cases to get the organ they need.